The “crypto” in cryptocurrency doesn’t necessarily mean that the value of the coin is determined by mathematics (whatever that means). It could also mean that transactions are determined valid or invalid based on digital (cryptographic) signatures. 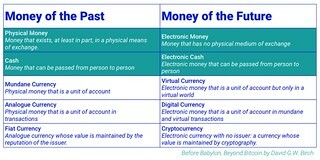 That’s what I would call a digital currency, but I’m always curious to see other taxonomies. It might not be that large a change. Just make banks use their e-money licenses, and insist e-money institutions hold their client accounts within Faster Payments. I don’t think normal people would notice. That would make commercial banks re-insurers and packagers of small business and household debt for discounting by the BoE. Which if we assume the BoE can’t bail in deposit holders, is where they are now, but without the BoE having any real-time control. Eventually the differing cost structures of lending and providing payment accounts would prise the two apart. BritCoin – love the name! Excellent Blog Post, and agree that the Identity element is the critical issue. I do also suggest that incumbent players will not be happy about the disintermediation and loss of significant revenue streams, however, with Open Banking and new entrants things could get really interesting. There is a need to change our relationship with money, banks and the economy. New ways of value exchange and value storage in the digital age, to enable a more inclusive global economy.